CM Magazine: Double Play. (Sports Stories). Toronto, ON: James Lorimer & Co., 2013. 126 pp., pbk., hc., & ebook, $9.95 (pbk. ), $16.95 (hc. ), $7.95 (ebook). ISBN 978-1-4594-0378-9 (pbk. ), ISBN 978-1-4594-0379-6 (hc. ), ISBN 978-1-4594-0380-2 (ebook). There's a sale in the baseball department - metal bats are twenty-five per cent off. I don't need a new bat, but I pick one up and take a strong practice swing. I whip around. A boy is moaning, doubled over. "Oh no! Did I hurt you? I didn't feel the bat hit anything-I'm so sorry!" The guy straightens, laughing. It's Eric, the new kid. "Just playing with your mind," he says. "Hey, thanks for pitching me those easy ones last practice." "Yeah, I knew. I've got a lot to learn. I've been reading up and watching videos online to try to understand the game better." "And you sure can pitch." Eric's mouth tilts into a smile. I smile back, trying to make my smile small and cool, but a giant grin keeps breaking my face open. Eighth grader Allie is a great pitcher. When she is asked to play for the Wolverines, a boys' baseball team, she accepts the invitation. She thinks she'll enjoy the challenge of a harder, faster game, and she's looking forward to wearing a real baseball hat; not a visor like the one she had to wear while playing on the girls' baseball team. Allie is used to people in her small town of Juniper Bay shunning her because her mom is a lesbian, but she is hurt when those closest to her lash out at her after she decides to switch baseball teams. Sal, her best friend, calls her a traitor; some of her new teammates are mean to her during practices and games, and her jealous, pet-stealing stepbrother Miles tries to get back at her by joining the girls' baseball team. 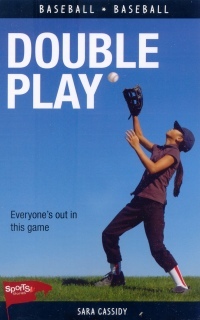 Double Play is one of the over one hundred books in the "Sports Stories" series. The storyline in this book is best suited to an audience of tween girls. There is a touch of romance between the main character, Allie, and one of her new teammates, Eric. They bond over their interests in baseball and slugs. Although there is a lot of baseball game narration in the book, and not much humor, young readers may enjoy the discussions on double standards and sportsmanship, plus the unpredictable ending.